IBM® Content Navigator provides a unified user interface for your Enterprise Content Management (ECM) solutions. It also provides a robust development platform so you can build customized user interface and applications to deliver value and an intelligent, business-centric experience. 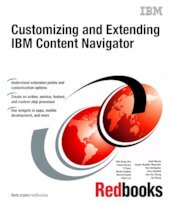 This IBM Redbooks® publication guides you through the Content Navigator platform, its architecture, and the available programming interfaces. It describes how you can configure and customize the user interface with the administration tools provided, and how you can customize and extend Content Navigator using available development options with sample code. Specifically, the book shows how to set up a development environment, and develop plug-ins that add an action, service, and feature to the user interface. Customization topics include implementing request and response filters, external data services (EDS), creating custom step processors, and using Content Navigator widgets in other applications. This book also covers mobile development, viewer customization, component deployment, and debugging and troubleshooting. This book is intended for IT architects, application designers and developers working with IBM Content Navigator and IBM ECM products. It offers a high-level description of how to extend and customize IBM Content Navigator and also more technical details of how to do implementations with sample code.